During this rather long trial by combat, John learned that his father, with whom he was very close, was diagnosed with terminal cancer. John knew immediately that this not only would be a tragic loss; but he would be called upon to assist the family both emotionally and financially. To John, this was not how his life was to unfold. Presently, John is an angry person and an angry attorney. In fact, stressed and tired, John was in Court today. Unfortunately, the Judge reprimanded John for his unacceptable tone and unprofessional behavior against the Prosecutor and State’s witness. John could not shake the comments of the Judge regarding the difference between assertiveness vs. bullying. At first, John thought that he was being singled out for zealously representing his client. 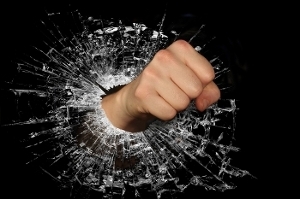 However that night John took a long look into the mirror and asked himself: “Am I too aggressive and unprofessional?” John decided to rethink the way that he was handling his emotions and anger. He decided also to sharpen his anger management tools. Unfortunately, attorneys are said to be even more vulnerable to the emotions of anger because of the adversarial nature of their profession, the fear of being perceived as weak and the perception of some that anger can foster success. Realistically, the very components of professionalism: courtesy and civility, candor, loyalty to client, meritorious claim, and zealous representation are affected directly by poor anger management skills. Take several deep breaths while sitting or lying down. Slowly count to 10 (or 20 or more) and think before you respond. “Laugh away” your anger by find the humor in minor upsets. Take a break and listen to your favorite soothing music. Take time to relax and enjoy hobbies, friends, family and pets. Talk out minor problems before they escalate. Simplify your daily routine and don’t be afraid to say “no” to avoid getting stressed out. Recognizing that much of his anger shared space with his deepest fears, our attorney John decided that he needed both an anger-management workshop and counseling. Additionally, John learned problem-solving techniques, stayed in shape, turned complaints into requests, learned to let go of resentments and made sure that he put a statute of limitations on his anger. For more information on this subject, or if you, or someone you know needs support and help, contact the Delaware Lawyers Assistance Program (DE-LAP) at (302) 777-0124 or 1-877-24-DELAP or e-mail cwaldhauser@de-lap.org.